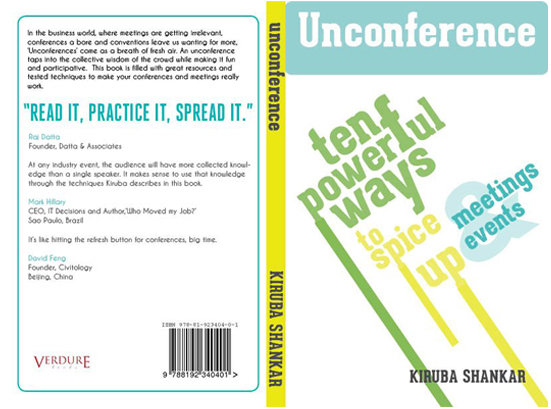 This cover is based on the idea of Graphic facilitation. 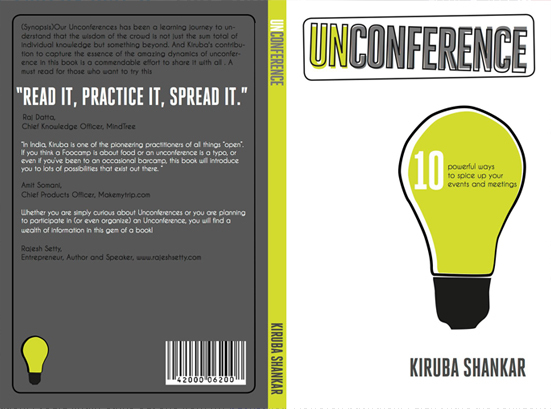 The light bulb implies the development of new ideas like unconferences. This composition was meant to be bold, direct, minimal and free of visual clutter. I decided to left-align elements on the front page to give it a fresh , adventurous and playful aesthetic. The color choice supports the aesthetic further. Since post it notes play an important role in unconferences I used them. 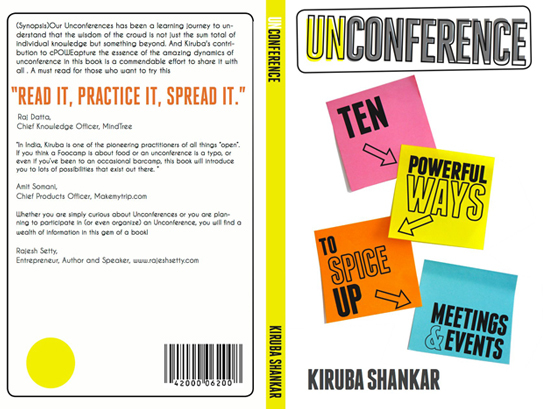 The post its are placed vertically to direct the eye from the title , to the tag line and then to the author’s name. This composition uses normal post it notes with a typeface that looks handwritten. It started off as my least favorite because I am not a big fan of machine made handwritten typefaces but definitely the most important version out of all because it was where the idea for the final cover evolved. 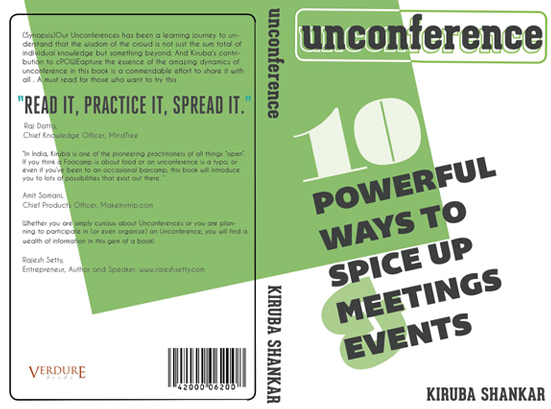 This was a composition which evolved from Unconference #3. I changed the handwritten typeface to the a bolder typeface which stood out against the colors of the post it notes. 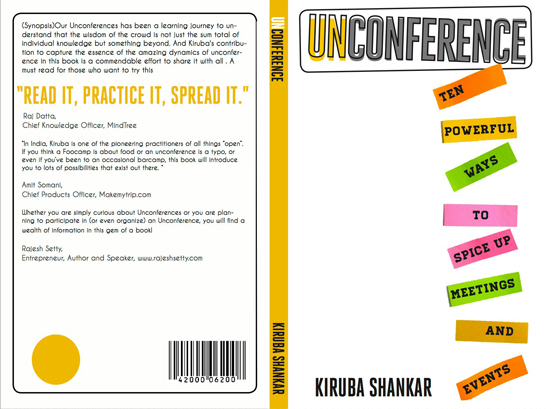 Unconference is all about interaction and I decided to add the arrows in the post it notes creating an interaction between the eye of the reader and the book cover. The arrows make the tagline direct and easy to read. What I understood from the book was that interaction is very important. 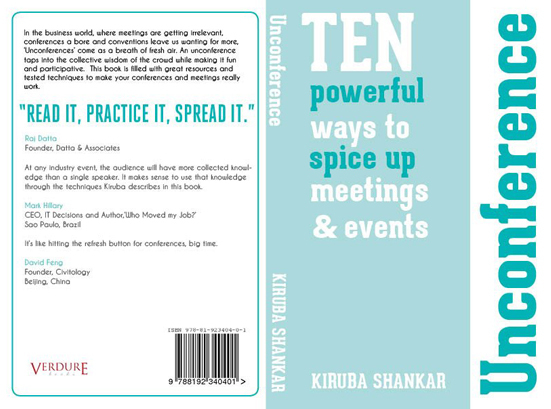 Hence I decided to create some interaction between the back cover, front cover and spine. I felt like the size of the post it notes was restricting my ability to emphasize the tag line, so I decided to scale up the post it note to cover up the page. 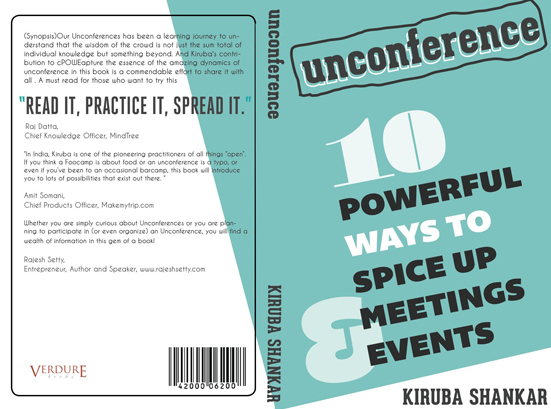 This version has slight variations from Unconference #5. 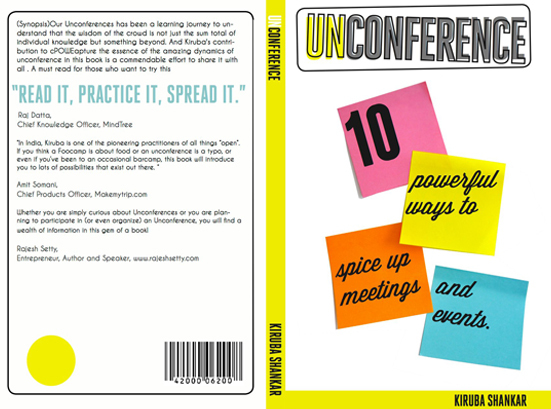 The post it note is scaled down so that the front cover has a little more air/ white space. I call this version the ” breaking the rules version”. I decided to emphasize the title more than the tagline.Why? Here are the reasons The viewer does not have time to read a long sentence while scanning the book store. There has to be a catchy cover that attracts them. 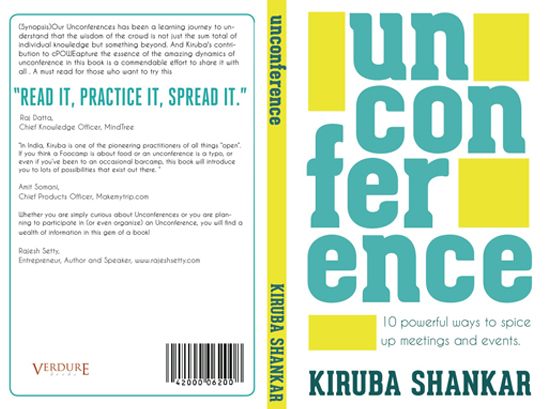 Here the title of the book unconference is made so huge that the viewer will definitely lift the book up from the shelf to read the synopsis and the tag line. Hierarchy plays an important role in this composition. The title is made in a size that can be viewed from far. The tag line is made in the size in which it can be read up close. This version uses colors usually found in post it notes. I wanted the colors to remind people about post it notes indirectly. I played with the alignment of the tag line and decided to give it an angle which gives it interesting dynamism. The idea behind this cover was to make it clean, simple and direct. I used a single color and chose generic tag line orientation and alignment.